THIS SITE STILL UNDER CONSTRUCTION - WE'LL BE PUTTING MORE LINKS UP ON THE OTHER TYPES OF RODENTS WE HAVE INFORMATION ABOUT. THANKS FOR STOPPING BY!!! Think owning an exotic pet or bird is right for you? Check out some stories from exotic animal breeders and see if you can make the sacrifices necessary. Animals are a joy unto themselves, but a lot of work and dedication. To send me an e-mail, click here! . What information would you like to see on this site? Everybody likes to see baby animals, and there are always babies looking for new homes, as well as older animals. Please look under our Animals For Sale section. Thanks! As the current price and (un)availability of the Glis glis prohibited me from having them, I settled for the more available and more reasonable Graphiurus murinus, or the common African Dormouse. Please click the link above for more detailed information. Please click here to learn more about the breeds of cavies I have known, some show info, and links to some more great sites. I have had Netherland Dwarfs, Mini lops and Mini Rex rabbits. In lops, I have had broken blacks, broken chinchillas and broken chestnuts, in Netherlands I have had silver marten, chinchillas, torts and blacks, and in Mini Rex I had broken blacks, tri colours and broken chestnut. Please click here to learn more about these breeds, see some photos, and get some links to some great sites. Although I don't have any yet, they are becoming a very popular pet, and lots of great information is available on them. Please click here for more information. I am the proud caretaker of a wonderful black tailed prairie dog named Chipper. Great info, some photos, and some links available here. I got these from a friend in Canada by the name of Christine Ham, PetitePaws! Keep an eye out for photos! Please click here to learn more about these cuties, see their photos, and find some links to more great sites. I have become obsessed with Dwarf Campbell's since I saw a beautiful pair of tri coloured females in a pet store. I bought them, and unfortunately one died almost immediately. I took the chance however, as I knew prior that they were shipped in to the store on a very warm day, and came in very dehydrated. I recently found an odd coloured one in a local pet store, photo to be uploaded this weekend, I hope! Please click here to learn more about Dwarf Campbell's Hamsters, see some photos, and find links to more pages. Pygmy mice are extremely difficult to find, but they are worth it when you can finally locate them! What little charmers! Information will be up soon. Please click here to learn more about these mice, see some photos, and find links to more good informative sites. I found some Chinese Hamsters at a relatively local pet store (Fin and Feather, University District, Seattle, WA), and fell in love with their beautiful faces. Please click here to learn more about Chinese Dwarf Hamsters, see some photos and find links for more information. On Nov 11, I brought Emilia home! She is a beautiful short tailed possum, and she came to me from Oregon. Her former owner could no longer keep her, so he and I met in Olympia, and I brought her home! Isn't she a doll? Click here to find out more about Emilia, STO's in general, and see some fantastic photos! I got my male degu from a fellow in Issaquah, WA, whose children no longer had time for him. Miles has an enormous cage, and he's VERY active! He and Missy get along great!! He has been to several science fairs and educational forums, and is very easy for the kids at the shows to handle. He prefers hiding in his wheel, and puts on miles and miles a day on his wheel. What a little darling! He's about 3 years old, and you can see some photos of him on the degu page. Please click here to go to my Degu page, see some photos, and get some links to good degu sites. Again, bitten by the 'odd' bug, I was captivated by a beautiful pair of Gambian Pouched Rats from Christine Ham of Petite Paws in British Columbia, Canada. She has awesome animals!!! Please click here to learn more about these great rats, see some photos, and get some good links for more information! If you have ever seen one of these cuties, you can understand the attraction! A combination of dormouse, chinchilla, prairie dog, sugar glider and bunny all rolled into one! The one drawback is they do require a lot of space, and should be given as much room to rove as you physically can offer. They tend to bond well with 'their' human, and can live 12 years or more in captivity! Please click here for more information, some great links, and a few photos. Striped Grass, or Zebra Mice! These are phenomically neat looking animals, but not the pet to have if you want a 'holdable or handlable' pet. Wow, can they jump! Please click here to see the Zebra Mice page, to see their photos, and to find links for more information. I started with a trio of mice a couple of years back, and when you see the phenomincal colours and patterns that they can come in these days, you'll be in love! Please click here to learn more about Fancy Mice, to see some photos and find some links for more information. I used to have rats a while back, then found them good homes after I moved out of a bad situation and didn't have time for them anymore, so I gave them away. Then recently, I adopted a group of rats from a woman in Portland who needed to find them homes, so I adopted some out and kept a couple back. It's a shame people get grossed out by them, they are so docile and intelligent! Please click here to learn more about rats as pets, see some photos and find some links for more information. 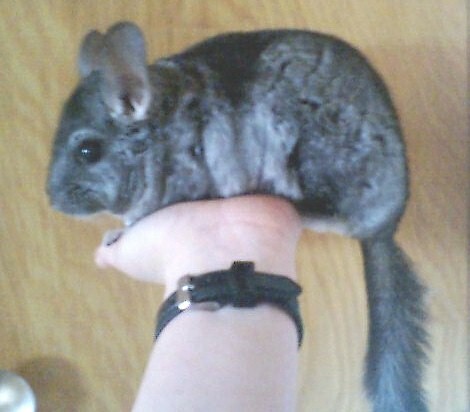 I've always wanted chillers, or chins as most people call them, and I had been emailing a gal about chinchillas. Then I went to the NW Captive Breeders Expo in October of 1999, and ironically this woman I had been emailing was there! I didn't know it was her until I had basically signed the deal to buy her last baby chiller, a beautiful, petulant grey male who I named Sebastian. Please click here to learn more about chinchillas, to see some photos of mine, and to find some great links for more information. Quakers!!! Quakers!! Okay, so I'm a bit biased... I have a quaker named Quacker, and s/he is the love of my life. S/He's almost 5, qp's hatchdate is on the 25th of July. S/He is a very good talker, but even better, s/he's quite in tune with me and my moods. S/He ALWAYS knows how to cheer me up, I kid you not. Just the cutest thing, despite what my mother says....As you can tell, there is some controversy upon Quacker's gender! Please click here to learn more about quakers, see some photos of the little darling, and to get to some links for more information. I also own an umbrella cockatoo, Gracie. I am her fifth owner, yes, fifth. The surprising thing isn't that they bond for life, nor that they can live 60 years. Nor that some go mentally insane after a separation or change in their schedule, or that they are said to require 24/7 attention. No, the surprising thing is that I was her fifth owner by the time she was 2 years of age. Gracie does not pluck at her feathers, her skin or her feet, she doesn't scream excessively for a cockatoo, she speaks well and clearly, and she is extremely friendly to those who trust her. She can smell fear from a great distance, she's quite in tune with people. Her last owner just felt they were a bit too far in over their heads, as she was their first bird - cockatoo's do NOT make a good first bird. They do need a firm but loving hand to raise them correctly. Please click here to learn more about umbrella cockatoos, see some photos of Gracie, and to find some links for more information. If you are looking for a great parrot, independent enough to be able to play on its own, and quiet enough for an apartment, look no further. Pionus are the most incredibly beautiful, wonderful and intelligent parrots out there, although they are frequently looked over for more 'vibrantly' coloured birds. They can learn to talk, and are captivating in nearly all aspects. Please click here to learn more about bronzewinged pionus, see some photos of pionus, and to find some links for more information. Please click here to learn more about cornsnakes, to see some photos, and to find some links for more information. For those of you who wish to see more reptiles than I've got here, one of the best resources for monitor lizards and boas can be found here.